Lately I've been rereading books... it's crazy! I normally don't do such things because I still know the plot by detail so it isn't a lot of fun. Yet I did find myself grabbing back to a book I read years ago, for school. 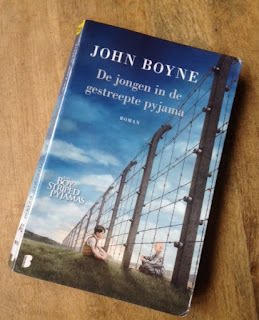 The Boy in the Striped Pajamas by John Boyne, yes I know it's weird because I'm never really that positive about books I read for school. This one was different though and I really enjoyed reading it. Now my brother has to read it and hearing him talk about it just made me read the story again. Bruno and his family have always lived in Berlin. It isn't until a day in 1942 that they have to move out due to his fathers job. Bruno isn't happy about that but doesn't have another choice than to move with his family and keep his mouth shut. When he arrives there, without any friends, he feels lost and irritated in the new house they all soon will be calling 'home'. There are no other kids around, or so he thought because when he looks out of his window he sees them. Weird kids in striped pajamas who look filthy. That doesn't stop Bruno from going on an exploration in his new environment, even though he's been told not to. As he's walking by the fence he sees out of his window, he meets a boy that's very different but also very interesting. The two boys soon find themselves meeting each other more and more by the fence. A friendship is created but not without devastating consequences. First of all I want to point out that I really fell in love with the cover of this book. My niece has another version but when I compare them, this one is my favorite. The two boys on the cover are also the boys who played the characters Bruno and Shmuel in the film which I'll talk about later in this review. First of the characters, I was so interested in both Bruno and Shmuel! Bruno is only 9 but does already question a lot that he sees. After I read the book I also wouldn't say he was one of the easiest kids there are in the world! But that aside I really enjoyed this character because he loved to explore and question everything he doubts. He's also a boy who always tries to be honest and we really see that in the book. But as an explorer kind of kid, he's also very observant which I was keen on most because we also read into his thoughts and he makes some good statements. Yet he still is very unaware of what's going on and who the people in the striped pajamas are and I liked that about him because I believe that many kids didn't know what was going on. Also his father doesn't bother to try and explain it to him so Bruno stays with a lot of questions which do create suspicion at a certain point in the story. As for Shmuel, I felt with him from the beginning! He's not happy and who would be happy? Shmuel really created a lot of emotional feelings in me and really made me feel like I was him. I felt sad, I felt anger because of what he was going through, what other went through. He's more aware of the situation, still in the dark for other parts, but he doesn't explain that to Bruno. I don't really know why he didn't, maybe because he was scared that Bruno wouldn't understand. We do see a big contrast with these two characters and I was really happy about that. Both come from another environment and each have their own good things and bad ones. Which also created parts where Shmuel was irritated by Bruno and vise versa because they couldn't understand each others world and feelings. They both grew up differently and the book really reflects that. After a while I can see what Bruno was talking about and in my opinion, she was also that one character that changed the most. I really liked her so much yet she only disappointed me and made me dislike her so much due to her changes. A little remark I've made in my head while reading, I think it'd be a great book with her as the main character and to see how she reacts on this all. Bruno gives us many hints to how she changes and I think it'd be a whole different type of book if it were written in her perspective. And if it was a book, I'd be really interested in reading it because I feel like she'd handle it a lot more differently. Some side-characters I'd love to discuss are Maria and Pavel. They're both servants for Bruno's family and each have a different background which will be explained in the book. I just wanted to mention them because I do feel like they contributed to this story. They might not be there a lot but when we do read about them, you can see how difficult the situation is for them too. They shouldn't talk about it, especially not to Bruno and then we really see them struggle with their feelings as I think many did during that horrible time. Both characters know so much and feel so much pain and anger but weren't allowed to talk about that out loud without facing consequences. So I think that was a great asset in this story! As for the plot, I was really surprised. I don't like reading books that are based on war but this book obviously concentrates on World War Two. In the beginning I didn't know if I'd really like this book but I really did like it because it surprised me. I never thought that a stunning friendship like this would capture so many hard emotions from that time. I've felt so much during this book from sadness to anger and also happiness that both boys find each other. The consequences of this friendship though were absolutely surprising as well as devastating! I had never expected for this to happen after everything I read in this book. It really touched me and I didn't know how to react afterwards for a while. I wouldn't say it was very thrilling but this book doesn't leave you untouched! I've never had a part in this book where I thought "God this is boring!". It's a book that reads very easily and isn't hard to understand. It also doesn't really focus on the horrible things that happened because we see this story through the eyes of a very young boy who doesn't know and understand what's going on. And I think that's what, for me, really made this a very good read. It doesn't focus on what happens, it focuses on the ignorance of people and the many questions that weren't answered in that time. So I was really happy that my English teacher made us read this book! I also saw the movie during his classes and even though I really loved the book, I kind of liked the movie a little bit more. For me personally it was easier to visualize and even gave me more emotions because I could really witness it in a way. I still recommend the book to everyone but I'd also think many would appreciate the movie! "You're my best friend, Shmuel,' he said 'My best friend for life." Wow, what a long review. You're so dedicated, and I like that you go through all those differents thoughts. I've looked at the title at the cover so many times, but I didn't read it. But it was - of course - one of the books you're always recommend after you've read and loved The Book Thief. I saw the movie adaptation of The boy in striped PJ, but I actually didn't like it. I think it was the story in itself, or was it the acting. It seemed a bit weird that no one in the family really understod what a concentration camp was. Especially the wife. Maybe it's beacuse everything is so clear to us now. That we've learned about it in school and in tv for so many decades that it seemed weird the didn't know or didn't want to see. I'm really impressed by your blog. I actually don't know how ol d you are, if you - when you mention school, means university or high school, but I like that you have so many thoughts about everything - I do too ;) - instead of the usual superficial YA blog review you find most often. I'm really looking forward to read more at this blog and to discuss books with you. Thanks you for your lovely comment! I'm pleased to hear that you like my blog. I also took your advice and made more paragraphs which is a great help, so thanks again! I just really liked the film because it was something to visualize and made me more emotional. Yet if you didn't really enjoy the movie, I'm indeed not so sure if you'd love the book. And I understand what you're thinking, it is indeed a little weird that the mother and other characters didn't understand what was happening. I just really enjoyed being in the head of a 9 year old to discover how he'd react on this all. I'll be sure to check out the book from John Boyne you mentioned! Sounds really interesting :) And thanks again for the lovely comment! PS. I'm 17 now and turning 18 in a month so I'm still in high school.